What is Dover Big Local in a nutshell? Dover Big Local has a Community Hub providing support, training, and networking opportunities, that help residents access services, develop plans to improve their area and empower them to find solutions that work to make Dover an even more vibrant and attractive place to live, work and play. Dover Big Local is run by a committee elected from its Partnership. Any Dover resident, business or organisation can become a Partner and support Dover Big Local’s work. Big Local nationally was launched by the Big Lottery Fund in July 2010. £200m of investment supports 150 small urban and rural communities throughout the UK so they can each come together to make their areas even better places to live. Dover was selected for funding because the town may not have been very successful in gaining funding and resources in the past. Through Big Local, managed by Local Trust, Dover will receive at least £1m Lottery funding over 10 years, along with support, training, and networking opportunities, to help residents develop plans to improve their area and empower them to find solutions that work to make Dover an even more vibrant and attractive place to live, work and play. The Dover Big Local team worked with local people to discover their the views and ambitions about the future of the town. Focus groups met to put the ideas into a plan required by National Lottery to allow access to Dover’s £1 million funding. Dover’s plan was approved by the national Big Local organisation in 2015 and is now being put into action. Projects in the arts, green spaces and environment, sports and leisure, economy and tourism and communication are all making a differnce in Dover with more exciting ideas for all these areas being developed all the time – what would you like to see happen? What are the Vision & the Plan? To create Dover’s Big Local Plan a Vision document was created. It was a description of what Dover people said they like and dislike about Dover today and most importantly what we would like it to be like in the future. Although a lot of ideas have been collected to develop Dover’s Plan, we will keep asking Dover’s people what they want to see happening throughout the Dover Big Local project, as priorities will change over the ten years of the project. The Plan was further developed from the ideas in the Vision document and includes the things we all are able to agree to build upon. However it is not “set in stone” and will be constantly revised to suit Dover’s needs – so we need your ideas and projects. 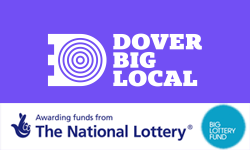 Dover Big Local will bring exciting new projects and improvement to existing initiatives to Dover. It’s YOUR town so now is the time to get involved! Whether you want to join the partnership, help to develop the vision, have an idea for a project for Dover Big Local or just want to keep up to date with how Dover Big Local is progressing, we need you. From highlighting local issues to offering a few hours help everyone’s contribution is important.